9ct yellow gold created ruby stud earrings. Set in a classic four claw setting with 5mm width. A gift she'll treasure. 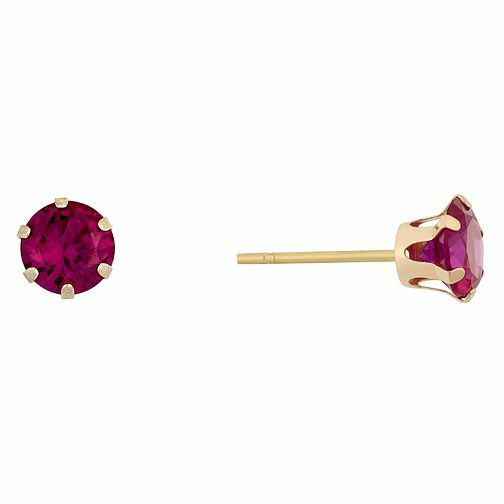 9ct Yellow Gold Created Ruby Stud Earrings is rated 3.7 out of 5 by 6. Rated 5 out of 5 by Anonymous from This product was a great gift I brought these earring for a birthday present for my mother. They are simplistic and not too large, which was exactly what I was looking for. She loves them. Rated 4 out of 5 by Anonymous from Red stone Earrings These were bought for my youngest Grand daughter as a Christmas Present, I am hoping that they will perform well as we have been disappointed in other earrings that were bought from this company in the past. My own thoughts were on first inspection that they were good for the money, time will tell.